I placed my first order from Sigma on Cyber monday. I got 20% off the Mrs. Bunny Essential Vegan Brush Kit. I did get charged an extra £23.33 from Royal Mail for customs charges. I was not expecting to pay a custom charge. I thought the delivery charge would cover any other costs. So if your from the UK keep this in mind before you place your order. I am so glad that Sigma ship worldwide. I was really impressed with the packaging the brushes came in. If you spemd over $30 you get a free gift. This months free gift is a travel size E25 brush. The Mrs. Bunny Brushes cost $155.00 which is £94.74 it is a bit expensive, but the brushes are excellent quality and will last you a life time. Check out Sigma’s website for some amazing products http://www.sigmabeauty.com. For 10% off your order use discount code Jan2014. The Mrs. Bunny brushes come in a container which I like to use as two brush cups. I like to use one cup for clean brushes and the other cup for used brushes that need cleaning. I think the Mrs. Bunny Essentials kit is great because its perfect for travelling with, because you know your brushes are safe & they wont get damaged. The Mrs. Bunny brushes & container are a Tiffany blue colour. If you don’t like the Mrs. Bunny blue brushes there are 5 more colours to choose from. The ‘Make me blush’ is a pink brush set, ‘Make me classy’ is a black brush set, ‘Make me cool’ is a turquoise blue brush set, ‘Make me crazy’ is a purple brush set & ‘Mr Bunny’ is another black brush set. They all cost $155 which is £94.74. I think the Essential brush kits are good brushes to get for professional make-up artists & for girls who really love make-up. The Mrs. Bunny Essentials kit contains 12 synthetic brushes. My free gift with my purchase in December was a travel size E05 eye liner brush. 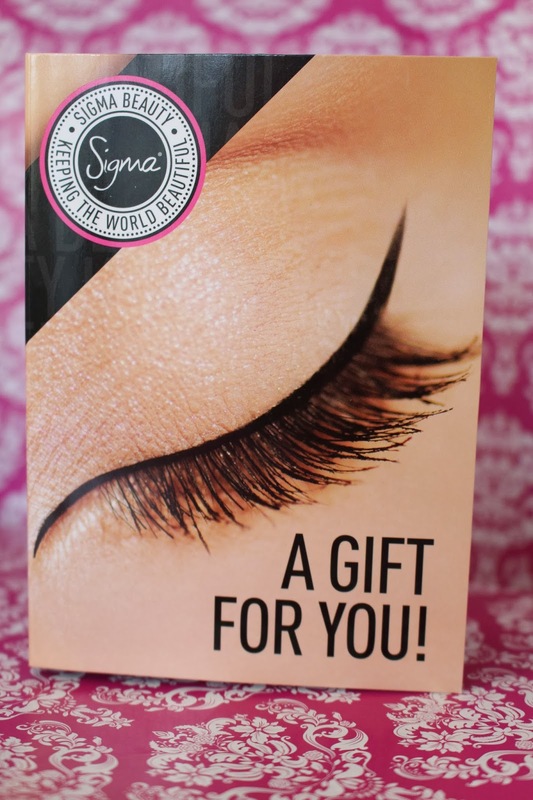 I love that Sigma give you a free gift with your purchase if you spend more than $30. I hope you like my Sigma blog post. Please leave me a comment & tell me what your favourite Sigma brush is. I love the look of these brushes, they're so pretty and girly! 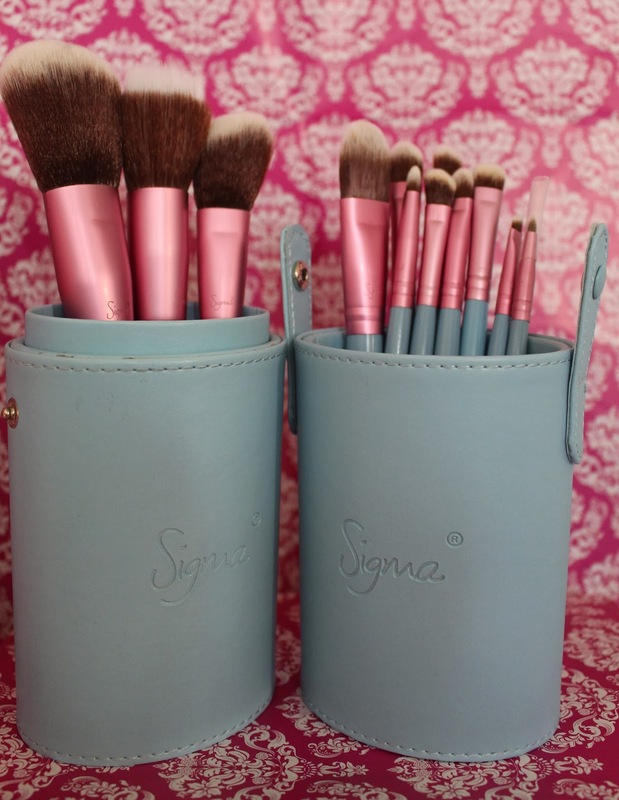 I love Sigma brushes! This is such a cute set! And it's great to take for travel. I mostly use the F30 and F50. I love sigma brushes. They are my favorite brand after chanel, but so affordable!